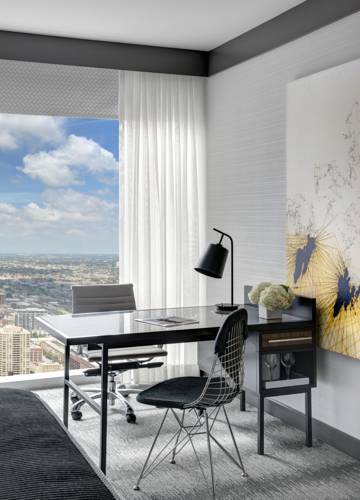 Newly opened in March 2015 - Loews Chicago Hotel - located in Streeterville - one block north of the Chicago River and two blocks east of Michigan Avenue. The property has 400 rooms - including 25 suites - signature lobby bar named ETA - celebrity chef-driven Argentine restaurant - Rural Society - by Iron Chef Jose Garces - more than 29000 square feet of meeting space - luxury spa with 3 treatment rooms - fitness center - 75-foot lap pool and the largest outdoor terrace in the city - Streeterville Social. The hotel is located in the heart of the city - within walking distance to great shopping and entertainment. Part of Chicagos streeterville area -Loews Chicago is steps from Michigan Avenue and Navy Pier. Shopping on the Magnificent Mile and entertainment on Rush Street are all within walking distance of the hotel. The beach - museums and the financial district are a short cab ride away.